Leonardo da Vinci compared the movement of water in nature to the movement of blood in an animal, and concluded that, “Water is the driving force of all nature.” Five hundred years later we still can recognize the truth in this statement. However, with groundwater resources dwindling and rainfall patterns becoming irregular, could nature’s driving force run dry? No, Earth will always have plenty of water, but it certainly can be in the wrong place at the wrong time. Drought is rapidly becoming one of the major threats to food production, and plant-water relations are fundamental to the study of plant physiology. 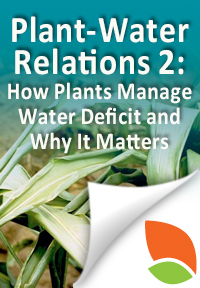 In the latest article in Teaching Tools in Plant Biology, we address the impacts of water deficit on plants in “Plant-Water Relations 2: How plants manage water deficit and why it matters”, written by me (Mary Williams), Mel Oliver of the USDA-ARS and Steve Pallardy of the University of Missouri. This lesson examines how bryophytes and xerophytes as well as seeds and pollen are able to withstand desiccation, and how crop plants and other mesophytes respond to water deficit through changes in their growth patterns and metabolism. The lesson further investigates the application of precision agriculture to stretch our limited water resources, new methods with which to identify drought stress in plants, and current efforts to breed drought-tolerant plants. Students are encouraged to explore this topic more deeply by an extensive, hyperlinked recommended reading list, and to extend their understanding by considering problems found in the teaching guide. By surveying the topic from “chemicals to current events,” the materials demonstrate the connections between fundamental plant processes and today’s pressing problems. Look for the next article in this series, “Plant Nutrition 1: Membrane transport and energetics, potassium nutrition and sodium toxicity” later this summer. It was frustrating to follow the path to this set of teaching tools and find that I had to purchase them. I will, however, keep poking around to see if I can find something to teach about plants that will engage my students. The possibilities seem to be here. You’re right, it is more appropriate to avoid implying intention in the evolutionary trajectory of plants. Your university should have an institutional subscription to The Plant Cell, which includes access to these articles. If you are unable to download the articles through your university system please let us know and we’ll have our subscriptions manager look into it.